12-inch LP ‘gatefold’ record sleeve for Sgt. Pepper’s Lonely Hearts Club Band by The Beatles. Printed photo-collage design of the Beatles with their heroes behind then, with 'BEATLES' spelled in flowers in front. On drum, as part of design. Written in flowers at front of design. One of the most famous albums of popular music, this record broke new ground both musically and in the design of its sleeve. Considered the first concept album it is recorded as though it is a performance by a mythical band rather than by the Beatles themselves. This is reflected in the cover. 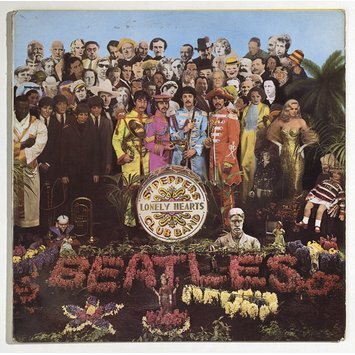 Peter Blake, a painter, decided on the novel approach of creating a stage set, where the Beatles (waxworks from Madame Tussaud's) join their heroes (lifesize photographs) and crowd around the band. Its innovatory and colourful design also meant that fans would spend more time looking at the cover: identifying portraits, reading the first full set of printed lyrics on a record sleeve, and examining the free gift - a cardboard insert of cut-outs, including a moustache and badges: the badges were apparently to be found stapled to the back pockets of fans' jeans. 12-inch LP ‘gatefold’ record sleeve for 'Sgt. Pepper’s Lonely Hearts Club Band' by The Beatles. Photo-collage design. Offset lithograph print. Design by M. C. Productions & The Apple, staged by Peter Blake & Jann Haworth. Photography by Michael Cooper. Produced Garrod and Lofthouse Ltd. Parlophone EMI. 1967. This is considered the first 'concept' album - the album us recorded as though it is a continuous show played by a mythical band. Its complexity and innovation amazed contemporary musicians and fans, both in Europe and America. The week following its release in Britain 250,000 copies were sold. On the advice of the art gallery owner Robert Fraser, Peter Blake and Jann Haworth, both fine artists, were involved to create a set with a crowd watching the Sgt. Pepper's Band. The artist's decided to create a three-dimensional set, with life-size cut-out figures and models from Mme. Tussauds, as well as a real floral display in the foreground. The Beatles were asked to suggest their heroes and favourite objects. The psychedelic nature of the music in this album and the drug-inspired lyrics were reflected in the heightened colours, collage of memories and general surreal quality of the sleeve design." Design by M. C. Productions and The Apple, staged by Peter Blake and Jann Haworth.